5.1-channel surround audio has become the benchmark for home theater sound, offering a far more immersive audio perception than regular two-channel stereo. The format’s popularity has gotten bigger and bigger, and decking out your home entertainment with a 5.1 setup nowadays is easy. If you’re planning to jump on the 5.1 o’clock train, check this out - we’ve rounded up the most exciting home theater systems for this year. For more background information on 5.1 home theater, see our comparison tables and buying advice below the picks. 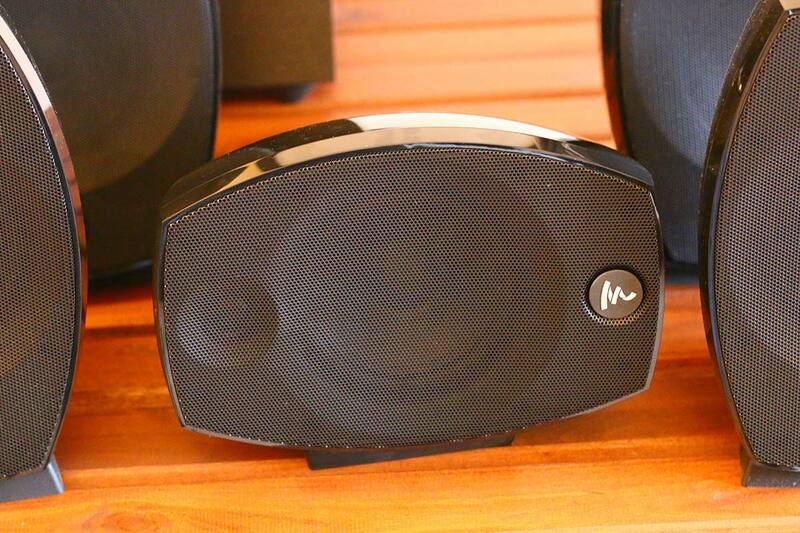 What We Like: Easily the best system for most people, terrific sound, great value. What We Don't: Very little. There's no question in our minds that the new Debut 2.0 system from ELAC fits the needs of just about everybody looking for a good 5.1 setup. It's the sound that does it for us. The audio quality has huge dynamic range for the size of the speakers, with hard-hitting bass that makes you feel every kick, punch, and explosion. While it doesn't have the detailed sound quality of something like the more expensive KEF T305, below, it also feels a little bit more natural and engaging. For most rooms, this is all you'll ever need. Like most 5.1 packages, you'll need to buy a separate receiver. In this case, we suggest going for the new Denon AVR-S740H, which not only packs in all the great features found in its predecessor, the 730H, but also adds advanced video standards and Amazon Alexa functionality. Together, the speaker package and the receiver play off one another beautifully, the amplifiers providing enough grunt to let the amazing F6.2 floorstanding speakers do their thing. You could argue that the price could be a little bit lower, but it's not an argument we'd support – they already represent fantastic value. And if you do want to spend less, we've got an option just for you below. For now, this is where it's at. What We Like: Superlative pairing, excellent sound quality and design. What We Don’t: The receiver pairs really well with the speakers, but isn't the best available. It’s one of the more expensive pairings on this list, but if you’re looking for an ideal combination, which will give you near-perfect 5.1 sound, it’s a home run. KEF have a serious presence in the home theater product roundups on the site, and with good reason: their speakers are absolutely superb. The 305 is their flagship 5.1 system, and offers a mix of T301 and T101 satellites - which are much taller than traditional satellite speakers - as well as a phenomenal T-2 sub. We're all about pairing here at TMS. It's not just about picking the best receiver – it's about picking the best receiver for the speaker system. With that in mind, we think the Yamaha RX-A880 is the ideal foil for the T305 system's detail and clarity. It's a solid upgrade on the A870, and offers a good range of features and sound quality for what is, at the time of writing, an identical price to its predecessor. That's the kind of thing we really appreciate, and if you go for the T305 speakers, you should pick up the RX-A880 too. What We Like: Very solid Yamaha package. If you have a very small listening space, as we know some of our readers do, then this could be the ideal combination. The Soundware XS 5.1 as an incredibly compact system that, while not offering anything to pique the interest of audiophiles, manages to put out decent sound from a very tiny package. The audio quality is crisp and clear, and while we do think the design of the speakers could be a bit better (particularly the binding posts) it’s a very commendable system for half a grand. While we think the SVS Prime Satellite 5.1 System does a better job in small spaces, this is an excellent alternative. To pair with it, we’re going for a workhorse Onkyo system that will get the job done without setting you back too much. The TX-NR575 has both Dolby Atmos and DTS:X, should you wish to upgrade later, as well as 7.2 channels to make things easier. Together, these two sound very good, indeed - especially if you don’t have a lot of space to fill. Don’t expect huge things from this combo, but it gets the job done. What We Like: Reference grade performance, great clarity, lots of features. What We Don’t: Not as stylish as other speakers. How do we know this is the best system for small rooms? Because we have a small room. Much as we’d love to save The Master Switch bunker was a massive, cavernous Bond lair, it’s actually a compact office, and so we get a good sense of what works in a small space, and what doesn’t. Trust us when we say that the SVS Prime Satellite 5.1 System works beautifully. The look of the speakers may be an acquired taste once you remove the grilles, but the clean, compact sound they offer – backed by the amazing SB1000 subwoofer – is absolutely ideal for small spaces. These are powered by a great A/V receiver - the Denon AVR-S740H. We’ve already name-checked this receiver, paired with the ELAC Debut 2.0 system in our top pick, and while we prefer that one to this, the forgiving nature of the 740H means that it pairs very well with a wide range of systems. It even offers extra speaker channels, in case you decide to add height speakers at a later date. If you have a small room, as most of us do, but you still want to experience great sound, then we’d strongly recommend this particular combination. What We Like: Tons of power and volume. This one is a little bit of a unique case. 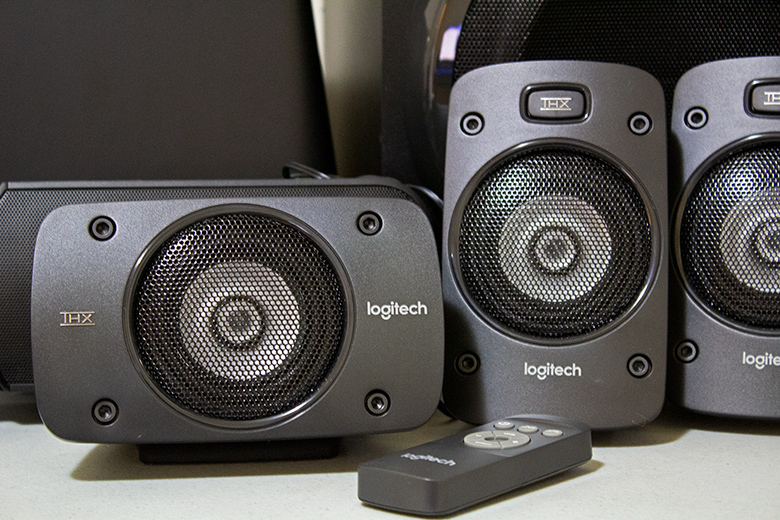 The Logitech Z906 isn't a typical 5.1 speaker package. It doesn't have a regular receiver – just a central control unit that you connect directly to your PC. As such, while you certainly can connect it to your TV and watch movies, it's not recommended – there are far better and more versatile options, like our top budget pick, the Yamaha YHT-4930UBL. But if you're a gamer, and you want to incorporate 5.1 surround sound into your setup – as many do – then this is by far and away the top pick. The Z906 grants you a ton of power to play with, meaning you'll get excellent volume levels, and its tiny speakers are easy to position. The system has excellent detail and speed: you'll always be able to find out where your enemy is shooting from, so you can shoot back. The Z906 is definitely not without its flaws – cable management, for one thing, can be tricky, with cables that never seem to stay put. But if you can deal with that, this is one of the most affordable and enjoyable options for upgrading your computer sound into something truly massive. What We Don't: No subwoofer? Really? Jamo is a relatively low-key brand, not very well known outside the home theater space. But they make some fantastic stuff, including their flagship S-809 HCS system. It delivers extraordinary audio quality, very comparable to the top-ranked ELAC Debut 2.0 5.1. It also has some innovative features – the company make Dolby Atmos speakers, and there are slots on the floorstanders in the S-809 system to slot these into, making it easy to expand later. One thing we don't understand: despite the fact that the company makes subwoofers, they do not offer home theater packages that include them. We don't think that's reason enough to exclude a package this good from the list, but it's still a bizarre choice. To pair with it, we're going for a workhorse Onkyo system that will get the job done without setting you back too much. The TX-NR585 has both Dolby Atmos and DTS:X, should you wish to upgrade later, as well as 7.2 channels to make things easier. Together, these two sound very good indeed, especially if you don't have a lot of space to fill. What We Like: A killer combo, with legendary speakers. What We Don’t: Very expensive. And don’t push it super-loud! Matching a set of speakers with a recommended amplifier power of 250 watts with a slightly-underpowered receiver is a bad idea. Fortunately, the RF-7 II speakers have an exceptionally high sensitivity (101 dB from 1 milliwatt), which means you don't need a lot of power to drive them. As long as you're not pushing this setup to the max - which would cause significant hearing damage anyway - you'll enjoy some of the best audio available, in our opinion. Klipsch's 5.1 package comes with two RF-7 II floorstanding speakers, an RC-64 II center channel, two RB-81 II bookshelf speakers, and a very decent Klipsch sub. While RF-7 III speakers exist, they have yet to be released in a convenient 5.1 package like this one. Our receiver pick for a pairing? We'll go for the amazing Denon AVR-X4500H. It improves dramatically on the old AVR-X4400H, and adds additional features, like Alexa functionality. More importantly, it really feels like it brings out the best in the RF-7 II 5.1, juicing it with enough power to give you the full experience. It comes with every surround sound codec you can think of, including Dolby Atmos, and can run up to 11.2 channels. It's possible to run the Klipsch speakers with a cheaper receiver, like the Denon AVR-S740H, but it won't sound nearly as good. Trust us: if you're going to spend this much money on a compact 5.1, you'll want to match it with a capable receiver like the AVR-X4500H. What We Like: Excellent, affordable sound with huge value-for-money. What We Don’t: Won’t satisfy serious audiophiles. One of the most common questions we get is what the best 5.1 system for music is, or how one plays music through a surround sound setup. The answer to the latter largely depends on whether the music you play was actually mixed for surround sound, and the answer to the former lead to some serious thinking going on here at TMS. Fortunately, we think we’ve come up with a solution: the Monitor Audio Mass, paired with the Onkyo TX-NR585 receiver. While all systems mentioned in this roundup do a passable job at both music and movies – and some, like the pricey KEF T305, do an excellent job – the Mass system felt the most alive. We would happily use it for music, especially when it’s paired with an excellent Onkyo receiver like the one mentioned here. You may want to invest in a standard hi-fi setup with a stereo amp and speakers, which may work better for just music, there’s nothing to stop you incorporating it into your existing 5.1, and this is how you should do it. What We Like: Def Tech and Sony were born for each other. What We Don't: Feels like too much of a compromise. Don't get us wrong: we love Def Tech. They make excellent stuff. But while this particular pairing does very well, and can even be found for under $1,000 if you look around, we just never felt like it was giving us all could. We had so much more fun with the SVS Prime Satellite 5.1 System – while it's definitely a little bit more expensive, it also feels like it's worth the money, and has a much better subwoofer, too. We can't help feeling that Def Tech felt a little bit short on this one; it isn't our first choice. The bigger version, the 800, used to be on this list - but it cost more, and we think this offers better value. Sony's STR-DN1080 is a superb receiver, a huge favorite in the home theater world, and it really does bring out the best in the ProCinema600 speakers. Be warned – it does lack some advanced functionality, like Amazon Alexa. That's not a problem that similarly-priced receivers like the Denon AVR-S740H have, so bear that in mind when you're shopping. What We Like: Industry-standard surround performance, stylish looks. What We Don’t: Won’t entirely satisfy true Dolby obsessives. The original Focal Sib Evo speakers immediately elevated themselves to the forefront of home theater audio with their launch back in 2002. The Sib EVO Atmos are their most recently updated version, and Focal have really managed to improve the overall soundstage and bass response of the speakers. As the name suggests, the new Sib Evos have been designed with Dolby Atmos specs in mind. Atmos is all about height information - things happening above your head - and the Sib EVO makes it happen by bouncing sound off the ceiling, using up-firing drivers in the front left and right speakers.Strictly speaking, this may not be a traditional 5.1 setup, as the additional two top-firing channels technically increase the channel count. 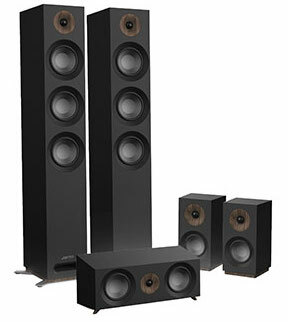 Dolby aficionados may want to invest in dedicated height speakers, but for the rest of us, these will do just fine. What We Like: No wires! What We Don't: Very expensive for an in-the-box system. A wireless home theater system? With five speakers? What wizardry is this? Admittedly, there's no magic here, just really clever electronics. And although we think Axiim have a little way to go before they perfect the concept, their new WM Series 5.1 system is a lot of fun to mess around with. And it comes with its own dedicated media center/receiver, too! Ultimately, said receiver isn't going to provide you with the versatility of, say, the Denon AVR-S740H, but it's still a phenomenal system. It sounds terrific, and you really can't grasp what a pleasure it is to not have to fiddle around with speaker wires after you've been mixing and matching receivers and floorstanders for a while. The downside, of course, is that you'll have to plug each speaker in separately – they all need to get their power from somewhere, after all. This can also be quite a difficult system to find. At the time of writing, it's no longer available on Amazon, which means you have to go direct to the manufacturer. And you will pay through the nose for this - $3,499 for the basic system is a huge amount! At a lower price tag, it may place higher, but not right now. What We Like: A superb, blockbuster combination. What We Don’t: Nothing worth mentioning. OK, yes, you can spend even more on a 5.1 surround kit, and get better results (*ahem* Definitive Technology) but this Marantz-Klipsch combo just sounds stupendously good, and Marantz have really ticked every box in terms of features, connectivity, control and sheer power with this receiver. The SR8012 is so well-endowed with modern tech that is guaranteed that it would move you ever so slightly forward into the future. It will connect to every audio-visual gizmo in your house, including iOS devices with Apple AirPlay, PCs or Macs via your home network with DLNA compatibility. It supports all major third party codecs such as Dolby Atmos, DTS:X and even Auro-3D, if you plan to upgrade later on. Of course, the SR8012 is expensive - maybe too expensive. Regardless, it sounds great with the Klipsch speakers, which are not only loud but incredibly detailed as well. We’ve featured this speaker package on TMS before, due to its clean and natural sound reproduction. Not keen on wires? This speaker package comes with a wireless speaker kit, and at this point, you’re already run out of reasons not to pick it up. What We Like: A great sub-$1,000 wireless system. What We Don’t: Not nearly as good as the axiim. When we talk about wireless speaker systems, we are most often referring to Bluetooth and Wi-Fi-enabled gear. The Enclave Audio Cinehome HD 5.1 is a little bit different. It creates its own network, staying off the Wi-Fi network in your home by relying on the channels in the 5.2 and 5.8 Gigahertz range, which are normally used by military and weather organisation, but which are open to civilians so long as they are constantly monitoring (and prepared to get out of the way for) radar use. It’s a clever system, and the good news is that the Enclave’s included receiver does the monitoring for you. You don’t have to camp out in your living room. That being said: we do think that the Axiim system does a much better job in terms of sound quality, and while we are entirely in favor of more and more wireless systems making onto the market, this is very much a budget option, and second fiddle to the ones above it. It’s still very good – it wouldn’t be on this list otherwise – but it’s not quite as good as it could be. 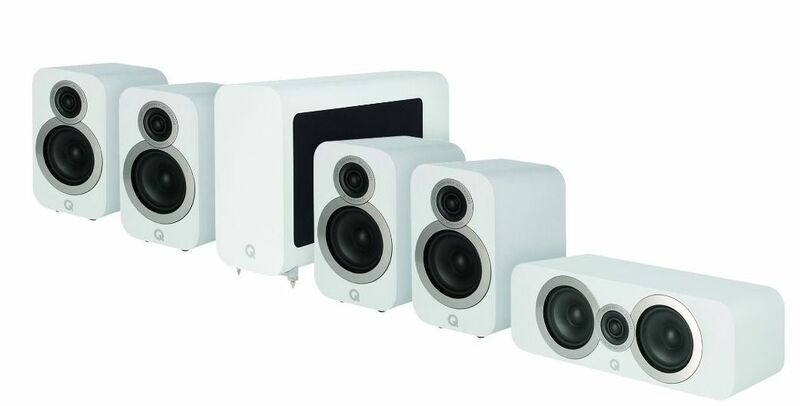 All the same, it’s a very decent budget home theater system. What We Like: Excellent spread and detail. What We Don't: The subwoofer isn't great. Q Acoustics used to be very difficult to find outside of the USA. That's no longer the case, and with a full American launch, all of the packages and speakers are now available locally. The 3010i Cinema Pack is one of their better offerings: a great value system that delivers superb detail, and which will happily fill up both small and large rooms. We aren't particularly enamored with the subwoofer – the one that comes with the SVS Prime system, above, is much better, and at a cheaper price. But this is still an excellent setup. In picking the receiver, we opted to go with the versatile Onkyo TX-NR787. It gives you a great range of surround sound codecs, and also has the capacity to go up to 11.2 channels, if you decide to upgrade later – as you might well do, with this particular system. If you want a cheaper option, we recommend the Sony STR-DN1080, which should buoy up the Q Acoustics system nicely. What We Like: Excellent sound and features. What We Don’t: A little expensive for an in-the-box system. On a previous list, we featured one of the smaller versions of this Onkyo package, the HT-S3700. This is a much improved version, we can’t quite believe it costs less than a grand. Although it doesn’t have the ability to push things to 7.1 without adding in an additional zone, it does offer 5.1.2 connectivity, allowing you to add height speakers… Yes, we know that’s technically a 7.1 system, but you know what we’re talking about. The included receiver puts out a decent level of power. As you can imagine, it’s matched very well with the speaker system, and delivers audio quality that belies its three figure price tag. Keep an eye on this one – we suspect but there are going to be even bigger systems coming out from Onkyo soon, and this may undergo a price drop, which makes its value even more staggering. Compared to other systems like the Q Acoustics setup, above, it doesn’t really push the boundaries, but it remains an excellent Home-Theater-In-a-Box. What We Like: A basic system with huge value, works well with the Pioneer receiver. What We Don't: Like most Monoprice products, it's as exciting as a loaf of white bread. If all you want is a straightforward system that delivers surround sound without any bells and whistles, then the Monoprice 10565 Premium 5.1 system is what you need. For less then $250, it delivers excellent sound using surprisingly small speakers, meaning that it takes up much less space than other systems – just compare it with the ELAC package, at number one. You will have to deal with the shortcomings, like the utterly boring design, as well as a measly one-year warranty. But it's still a beauty of a budget system, even if the Premium tag is something of a joke. The Pioneer VSX-1131 receiver completes this home theater package. Yeah, we're featuring it twice, but it really is a versatile little model. This is one of the most advanced receivers in its class, with UltraHD 4K visual support, Dolby TrueHD, DTS-HD Master Audio, built-in Bluetooth Wireless Technology with aptX support, plus a very cool app for complete Wi-Fi integration. The energy-saving ECO Mode in its amplifier is useful, and the amp itself has more than enough power to push the system. The sound doesn't quite measure up to the titans, but for under $1,000, we think this offers some of the best value around. What We Like: Paradigm and Denon were made for each other. What We Don’t: Bass suffers - just a little bit. In comparison to the big dogs at the top of this piece, the combination of the Paradigm Cinema 100 CT 5.1 setup, and the Denon AVR-S940H receiver isn't going to shake the walls. But we think they work well enough together. Like other models on this list, the receiver checks all the boxes – 4K, additional channels, for wireless connectivity and a decent level of power – and really gets the job done. But it's the speakers we've truly fallen in love with. Maybe it's the fact that their Amazon product photo makes them look like a gang of flocking cybernetic pigeons. Paradigm are a legendary speaker maker, and they've got a gem here. The technology includes domes made of anodized aluminum, as well as highly tuned crossovers that really make an impact on audio quality. We are not wild about the subwoofer, but it’s far from bad – just not out of this world in comparison to other models. All the same, you’ll be extremely happy with this selection of kit, which will set you back less than $1,500 – always a win in our book. And don't forget: just because we recommend a particular pairing doesn’t mean you shouldn’t feel free to mix-and-match. If you see a receiver you like the look of, and think it will go nicely with a set of speakers, fire away! These days, most components will play nicely together. What We Like: Orb Audio has some great design, pairs well with the Onkyo, highly customisable. What We Don’t: A little too pricey for what you get. Orb Audio offer quite an unusual system here. To go with their Sub200 subwoofer, you get five of what they call their Orb speakers. These can be mixed and matched in any configuration, and placed just about anywhere. In addition, it’s very easy to upgrade by adding additional Orbs into the mix, although it must be said that we do think the basic system is a little bit too pricey for what you get. We played around a little with receiver choice here, and we think we can go for an old standby: the Onkyo TX-NR830. It does an equally good job here, and offers the ability to upgrade with more speakers, which is no doubt what Orb Audio had in mind. If this undergoes a price drop, it could be essential, but as it is, it’s just a very good system that we wish cost slightly less. The Yamaha YHT-4930UBL It is an excellent option if you are looking to spend slightly less money, although it won’t look nearly as cool. At CES 2018, we had a glance at a couple of very exciting 5.1 home theater system packages coming within the next year. The big one is the Klipsch Reference Wireless system. Like the Enclave and Axiim systems in our list already, the Reference Wireless is wire-free – each speaker is individually powered. Klipsch have experimented with wireless systems before, without much success, but they seem to be giving it their all this year. This new system, in which all the speakers retail for less than $700 each, relies on WiSA – a transmission protocol that lets amps and speakers talk to each other. WiSA has been around since 2012, but it's seeing a little bit of a resurgence, thanks to the advent of smart TVs - especially from companies like LG. We'll aim to test the Klipsch Reference Wireless system before it drops later this year. Another manufacturer we are paying close attention to is Monitor Audio. Their Mass system already features on our list, and they have a brand-new combo coming: the Gold 5.1. It's an absolutely stunning set of speakers, with glorious, varnished wood cabinets, and we would bet a lot of money on it sounding absolutely superb. We don't have any indication of price yet, and it must be said that the system looks fairly traditional, but you can bet it will be replacing the older Mass on this list in no time. And then the receivers. Inc. means it's included in the speaker package. Note that some receivers appear on our list above more than once, so we've only given them one entry here, in the order in which they appear. What Is A 5.1 Home Theater System? Welcome to the wonderful world of surround sound. Your audio is about to stop coming at you head-on, and come at you from all directions. This type of system consists of five speakers (often called satellite speakers) and a subwoofer, all connected to an A/V receiver. The speaker arrangement includes a center channel speaker, left and right front channel speakers, a subwoofer and left and right rear surround speakers. The term 5.1 comes from the fact that there are five speakers, and one subwoofer. This naming convention is standard in home theater, so if we were to tell you about an 11.4 system, you would correctly assume that it consisted of eleven speakers and four subwoofers. The A/V Receiver is linked to a TV (one or more, depending on the receiver's specs) and converts all audio-visual data received from your sources - Blu-Ray/DVD/CD players, Bluetooth, W-Fii etc. into surround sound playback, where sounds can freely "hover" between the surround speakers. In this guide, we're not going to go into what makes a 7.1 or 9.2 system. Those are huge topics in their own right! If you do want to find out more, here's a good breakdown of the differences. This isn't about just shoving the most expensive speakers and receivers into a list. It's about pairing - about finding the combos that work well together. Obviously, price is an indicator of quality, but we also take into account sound quality, value, build quality and easy-of-use. The brands featured in our quest for pointing you to the best 5.1 surround systems are all well-known, with decades of experience in the field of home theater. We've gone for complete 5.1 speaker systems (as opposed to individual components), and in most cases, we've suggested a great receiver to pair. We've made sure to highlight the best systems and receivers in a few key categories, meaning you should be able to find one that works for you - no matter what your budget. Whether you have $200 or $2,000, we've got something for you. 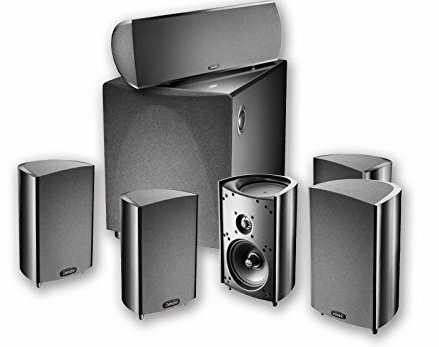 Serious home theater enthusiasts often created their systems from individual components, matching an A/V receiver with a pair of floorstanding speakers, individual satellite speakers, and a carefully chosen subwoofer. The problem is, in the 5.1 range – which is generally considered to be the minimum number of speakers needed for surround sound – there's very little point in doing this. Yes, you will get better sound, but it's often not worth the hassle – not when there are so many excellent packages out there. Hence the rise of something known as Home-Theater-In-A-Box (HTIB): a complete surround sound package, including receiver, that you can buy in one transaction, and which will set you up. We already mentioned that these have an unfairly maligned reputation, but we think that for many people, they are an ideal solution – and a perfect gateway drug into the joys of surround sound. While not every system on our list is technically an HITB system, in that you will need to buy an additional receiver, we still have a few. Arguably the best on the list is the Axiim 5.1 WM Series Wireless Essential Bundle, Which offers everything you need to get set up in one convenient package. You will however pay just under $3,500 for it, so be warned! Generally speaking, this is pretty simple. A lot less complicated than bigger systems! Your center speaker goes directly below and in front of your TV. Your front left and front right speakers (which are sometimes floorstanding speakers) go on either side of it. The remaining two satellite speakers go on either side of your listening position, usually bolted to the wall, or on separate speaker stands. The subwoofer takes a little bit more work. You need to connected up, and place it in your listening position – in other words, on the couch. Then, playing some bass-heavy content, like music, you need to crawl around on the floor, and see where you like the sound of the bass best. That's when you place your subwoofer. Yes, it sounds strange, but this particular manoeuver is known as the subwoofer crawl, and it works. By the way, don't be too stressed about having to lift a heavy subwoofer – most of the ones that come with 5.1 systems are relatively light. The one that ships with the SVS Prime Satellite 5.1 system, for example, weighs only 27lbs. To experience your system at its best, you might need to fine-tune your setup after some initial listening. Here are a few extra tips. Create a clear path between you and your speakers - if you can't see the speaker, sound is most likely being blocked and the resulting audio performance might be far from its best, due to external acoustic factors and not to the system itself. You can also achieve a far more balanced sound by minimizing bare walls and floors. Having said that, many A/V receivers have flexible settings and presets, allowing you to adjust levels - not only between speakers, but also between the volume of movie dialogue or background music and special effects. This can make a huge difference to your viewing experience. If and when available we recommend using the built-in room calibration which normally involves the use of a measurement microphone (supplied with the receiver). You don't need to be an acoustician or a sound engineer - just leaving the mic in the recommended position and pressing a button is all that's needed. The internal acoustic DSP processing measures frequencies and levels from the subwoofer and each satellite speaker and optimizes them to suit your room! By the way, if you're worried about how to connect your receiver, don't be. We've got you covered. Oh, and one more link, which you'll need if you hit any issues: our handy guide to the ten most common home theater problems, and how to solve them. You're welcome. Any home theater system is going to have, at minimum, two things: a receiver or amplifier, and a set of speakers. Right? (Please say yes. Thank you.) Now obviously, it's the receiver that sends the power to the speakers, and to get the best out of your system, you need to be sending approximately correct levels of power out to the speaker drivers. To do that, we rely on a statistic called RMS wattage. RMS stands for Root Mean Square. Please don't run screaming. You absolutely do not need to know the mathematics of how this works to understand what it means put simply, RMS wattage. It how much power an amplifier or receiver can put out over an extended period of time. Sometimes, you'll see it referred to as continuous wattage. It's a little bit different from dynamic, or peak wattage. This is the absolute loudest an amp can go, over a short period of time. Think of the differences between RMS and dynamic as being the differences between a marathon and a sprint. Why is this important? Well, every set of speakers has certain power requirements – usually listed as a certain amplifier range (for example, some of the speakers in the ELAC Debut 2.0 5.1 system have a recommended amplifier power of 10-160 watts per channel. That means that, ideally, you need an amplifier where the RMS and dynamic power are both in that range. We say ideally because in most cases, you actually don't have to think too hard about matching speakers and amps. Unless you're going to be playing things at ultrahigh volumes for extended periods of time, you'll probably only be delivering a fraction of the amount of power required to damage a speaker. As long as you don't hook up an amp with less RMS power than the minimum required by a speaker (which would be really bad) you'll be fine. One further point. See that weird symbol (Ω) after our wattage stats in the table above? That's an ohm symbol, and it tells you the amount of power put out at a particular level of electrical resistance. Ideally, you should match these to the speakers. So: if a set of speakers has a recommended amplifier power of 50 watts RMS at an impedance of 8Ω (which you'll sometimes see referred to as nominal impedance), then you need to make sure that your receiver puts out at least that amount of power at 8Ω. Still confused? Don't worry – even we get this wrong sometimes. One of our writers has put together what we consider to be one of the best guides out there to this very topic, which you should really check out. Once you're done, you'll have absolutely no problem matching two systems. You'll often see these terms thrown around, and we've mentioned them in our receiver specs. They are what are known as surround sound codecs: software programs containing algorithms that mix the incoming sound and distributed evenly between your speakers, creating a certain type of effect. There are two main names in this particular area: Dolby, and DTS. There are significant differences when more speakers are added into the mix – Dolby uses something called object-based surround sound, and relies on height speakers for its industry-standard Atmos codec, while DTS (and its DTS:X codec) is a more user-friendly system that doesn't need height speakers to work. But the key thing to remember is that in the 5.1 arena, there are very few differences between them. Oh, there may be slight differences depending on the speakers and the receiver in question, but overall, you shouldn't stress too much about this particular element. It's always a plus when you're able to get Dolby or DTS codecs in 5.1, but you are unlikely to be able to take advantage of the latest versions – not unless you upgrade the number of speakers you use! Don't let this deter you, however, from getting started with this particular branch of home theater. You'll have a lot of fun, even if you don't get the latest codec. And by the way, simply because you start with 5.1 doesn't mean you can't upgrade later, and take advantage of things like Dolby Atmos and DTS: X. For example, the Sony STR-DN1080 receiver is capable of utilising both of these. 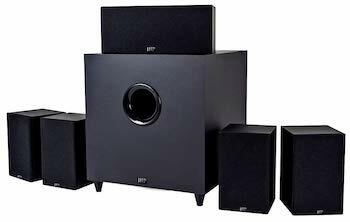 Another savvy approach, especially for larger home theater rooms is using additional subwoofers - the so called 5.2 or 7.2 setups, where the number after the dot represents the system subwoofer(s). You might think that a regular 5.1 receiver might prevent you using a second subwoofer (due to all outs being already used up), but check at the back of the subwoofer speaker itself, as many of them have a line-level audio output, allowing for direct link to a second woofer. Larger format A/V receivers, such as 7.1, 7.2, 9.2 or 11.2 obviously make such extended setups simpler, and despite their higher speaker capacity, 7.2 (or higher) receivers are widely used in regular 5.1 surround setups, where the 'additional' speaker outputs used for separate zones - such as a 2.1 setup in another room for instance. OK, you see the speaker table above? You see how we’ve listed the lowest and highest frequencies a particular system can put out? This is important for a couple of reasons. The first is that it gives you an idea of just how wide the range of of sound your speakers can deliver. Humans can’t really hear anything above 17kHz (kilohertz) so don’t be swayed by a system that can go up to 50kHz, but it’s good to know nonetheless. One of the things you may have to do at some point is set the subwoofer crossover. Simply put, this is the point in the bass playback at which the subwoofer takes over, meaning that the additional surround speakers don’t have to put out low bass notes. That means more power for the things they are good at. Setting this is absolutely simple. Usually, it’s done via your receiver’s on-screen menu. All you need to do is look at your subwoofer specs, and see the highest frequency it can go. If it’s at, for example, 250Hz, that’s where you set the crossover point. You’ll be amazed at just how much of a difference this can make to your system. Thank God for HDMI. It’s simple, easy-to-use, high quality, and does pretty much everything you ask of it. HDMI cables carry audio and video signal between different points – such as from your games console to your A/V receiver, or from your receiver to your TV. You almost certainly use them before, but if you haven’t, they are the thin connectors with multiple pins shielded by a metal frame. They are robust, and straightforward to use. They are also the industry standard, and every receiver worth its salt will have at least a few inputs and outputs available to use. Generally, there are far more inputs, as you usually only need to output to your TV, and it’s up to you to figure out just how many you actually need. For the record, the receiver in this list with the greatest choice is the Marantz SR8012, which offers eight HDMI inputs and a staggering three outputs. We’re not even sure what you’d use those for, unless you’re going for an absolutely enormous multiscreen TV system! Still, they are nice to have. And by the way, if you are looking on the back of any of these receivers, and think we’ve got the HDMI input count wrong, check around the front. There is almost certainly an HDMI input on the front panel, and we’ve counted that one as well! Welcome to one of the more contentious issues in home theater. 4K is a picture standard that is supposed to provide an absolutely stellar viewing experience. While we don’t really deal with visuals here at TMS, it’s worth noting that almost all receivers advertise themselves with their 4K capability, and so we think it’s worth mentioning, even if it’s not something we’re going to spend a great deal of time on. Essentially, 4K offers a picture resolution of 4,000 pixels, which is absolutely huge. The problem is, while there are plenty of TVs and receivers that take advantage of it, there is not always a lot of content that does the same. 4K movies and series are actually quite rare! It’s likely to become more common over the next few years, but for now, consider this an extra little bit of information to have, and possibly something that you can use to future proof your system. Don’t let it affect the one you buy. Streaming wirelessly from a smartphone or a tablet to your 5.1 surround sound A/V receiver will naturally require you to 'pair' your device with the system exactly as you would with a stereo speaker system. With Wi-Fi capable receivers, you really need to treat those as how you would when integrating a Wi-Fi printer within your home network - any suitable media player can stream via Wi-Fi to your receiver, as long as they are all 'tapped' into your Internet router. As far as audio quality is concerned, Bluetooth is a lossy platform, which means the audio is compressed to save space at the expense of quality, but look out if your system has the aptX-capable Bluetooth streaming. AptX has really grown in popularity in the last year or so, but to coax out its full CD-rivalling audio potential, it is important to make sure that both the source (your smartphone or tablet) and the receiver are compatible with the aptX mode. You'll notice the presence of a couple of wireless home theater systems on our list: the Axiim 5.1 WM and the Enclave Cinehome 5.1. While these do have disadvantages – chiefly, that you need to plug each speaker into a mains socket to provide power for it, and that their audio quality isn't going to be nearly as good as wired systems – they have significant advantages as well, which you will realise the second you stop having to mess around with speaker cable. They even offer innovations of their own: the Enclave system relies on its own network in a discrete frequency range, taking it off your home Wi-Fi network. Sweet! There's nothing to say you can't use a conventional 5.1 system for your PC. All you need to do, after all, is connect the receiver to your computer tower, and you're good to go. But there are definite advantages to using specialized systems, like those found in our roundup of the best computer speakers of this year. That's because those are dedicated 5.1 systems design for PC gaming, and although they constitute a bit of a special use-case, they are definitely worth your time. Firstly, they tend to be smaller, to take into account your closeness to the computer screen, as well as the more compact environments that most PC gaming takes place in. Secondly, they are tuned slightly differently, and more emphasis is given to soundstage. This is so you can accurately determine where in space a particular sound is coming from, making it easier for you to find and murder whatever happens to be shooting at you. Finally, they almost always come as complete packages, with a specialized control unit that offers less functionality than a typical receiver, but which is specifically set up to work with the accompanying speakers. The roundup mentioned above lists several of these packages, but we've put just one in our list: the Logitech Z906. At $272 the time of writing, it's an excellent way to boost your PC gaming sound. By the way: if you're a console gamer, then you can quite happily get a 'regular' 5.1 surround sound package. Chances are, you won't be squashed up against the screen, and you'll be in a slightly bigger space! Normally, you wouldn't really see the term WiSA in a discussion of 5.1 home theater. It stands for Wireless Speaker and Audio Association, and is not only an organisation, but also the name of a technology. Put simply, the technology allows different audio components to communicate with each other – similar to Bluetooth, Wi-Fi, or Play-Fi. It's specifically designed to transmit audio with virtually no latency, which is super important if you're watching a movie or series. Why are we only mentioning it now? Because you're going to be hearing a lot more about it in the future. As smart TVs become more entrenched in our lives, they're going to need to send audio directly to speakers. That's where WiSA comes in. It's a proven, existing technology for transmitting audio wirelessly across short distances, and we think it's going to be everywhere this year. Think about it like this: one of the most annoying things about traditional home theaters is wiring. Having to connect every speaker to a central point is a giant pain. Wireless home theater – and it's worth noting that there are a couple of excellent systems on our list already, like the Axiim 5.1 WM Series – is the next logical step. Sure, you have to plug each speaker into a power outlet, but it's not that big of a deal for most people. 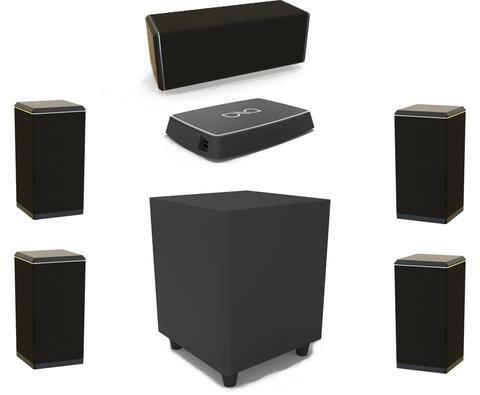 Currently, there aren't many existing wireless speaker packages for home theater, because transmitting audio seamlessly to five or more speakers at once is actually pretty tricky. WiSA simplifies the process and works with almost no setup required. Right now, there are no systems on our list that use WiSA – but they're definitely on the way. The forthcoming Klipsch Reference Wireless system uses WiSA, and we will have many more thoughts on that in due course. In particular, we are looking forward to seeing how the sound quality holds up versus a traditional wired speaker systems. It doesn’t matter how large your television screen is, or how impressive the resolution. If you don’t have great sound, then you’re only getting half the experience. The phrase 'surround sound' immediately makes people think of a number: 5.1. The 5.1-channel surround audio system has been around for two decades now, and has become the absolute standard for home theaters. You can survive with just a regular set of speakers. You don’t, strictly speaking, need a subwoofer. But you cannot believe the difference having one will make. This big box of wonder will do incredible things to your sound. There’s no denying that home theater systems can be complicated. Actually, forget can be; they are complicated. When you’ve got a system with this many wires and settings, it’s surprisingly easy for things to go wrong. We get it. Home theater can be crazy confusing, especially if you’re just starting out. 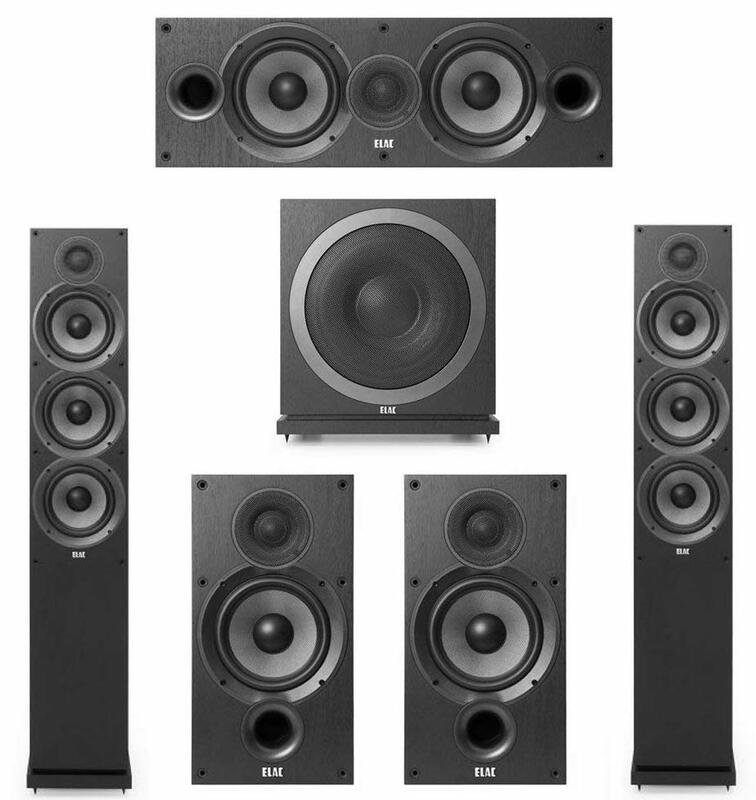 In one of the biggest decisions you’ll need to make is whether to go for a basic five-speaker system or a more powerful seven-speaker system.